The fourth edition of the bicycle race ‘I want to be active!”, an intiative of AMURTEL Romania took place on Sunday, October 14, 2018, in Panatua. The competition was organized with the cooperation of the local town hall, and financed by the Buzau County Council. The goal of the annual race is to encourage sports and outdoor exercise, and we hope to attract even bigger numbers of bicycle enthusiasts in the coming years, as the competition gains popularity in the zone. All of those who took part in the event had a special day – sharing emotions, encouraging each other and thus generating a team spirit, and very positive energy. It was a briskly crisp autumn day with golden leaves floating in the air! This year the competition enjoyed the presence of approximately 200 participants, of which 20 were young, enthusiastic, local volunteers which ensured a smooth behind-the-scenes organization. The volunteers were students from the local high school “Radu Vladescu” in Patarlagele, and participated alongside with some of their teachers as well as teachers from the local primary school in Panatau. We are particularly grateful for AMURTEL’s young volunteers who are present at all of our events in this year: Iasmina, Adelina, Ana, and Dumitrita, as well as the local photographers Mari Gavrila and Elena Dinu. At the starting line, we had 47 competitors enrolled, with ages between 7 and 50 years old. But all were inspired by a very active, spunky elderly lady over 60 years old! 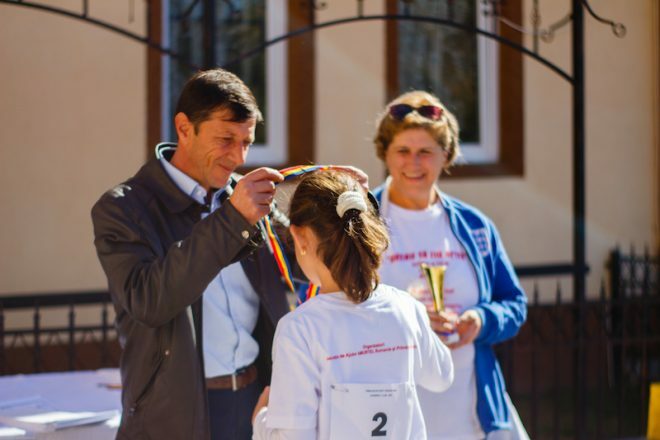 The competition took place under the careful supervision of the Police, Gendarmes, and representatives of the Town Hall, the Mayor Nicolae Stoica and the Vice-mayor Dumitru Visan, who accompanied the participants divided in 7 age groups, along the entire race-course. The efforts of the participants were recognized by participation certificates and prizes for first, second and third places with medals and trophies.